The sitcom’s creator Suzanne Martin wanted a big, Victorian-era porch where the women could gather: “It is the antithesis of what our characters knew from their life in Los Angeles, a symbol of the slower, more gracious lifestyle that our characters discover in Ohio,” production designer Michael Hynes told the L.A. Times. “I suggested a porch swing in addition to chairs, because the swing is the ultimate throwback to a Norman Rockwell-like past that we all get nostalgic for,” Hynes said. 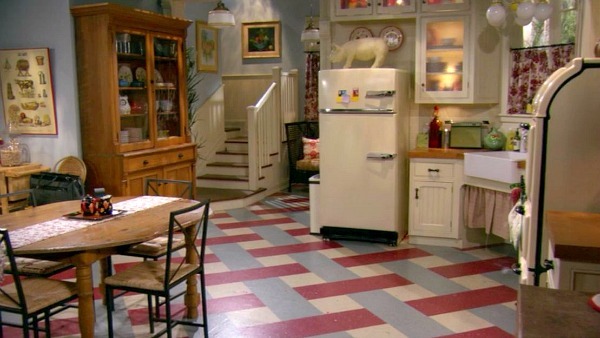 The floor looks like old linoleum but is actually a pattern painted onto the studio’s concrete floor. Just a few changes from the first season to the second. For example, the framed poster above the butcher block was replaced by plates, and there’s a new wall hanging in the stairwell (above Valerie Bertinelli’s head). Have you seen the show? I watched most of the first and second seasons while taking screenshots for this post and it was better than I expected. My wife and I grew up on the west side of Cleveland. Though we’re hardened east coast DC area residents now, we always have a bit of a soft spot for cool houses in the Cleveland area. 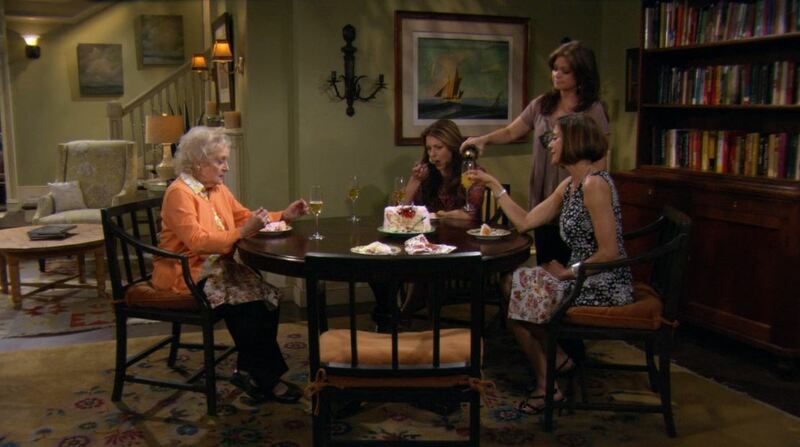 There are a whole bunch of really great places that are in serious need of attention, and many look much like the Hot In Cleveland house. Either east side, west side, or close in areas like Ohio City or Tremont all have great places (I mean, the Christmas Story house is in Tremont) for reasonable prices. It’s just a shame the city cut up the old neighborhoods when they installed the highways through the city. Ruined a lot of the character and quaint small town feel. I’ve never even heard of this show but I love the house! I wonder if it’s on Netflix. I’m digging those pillows on the living room couch. Oh, and also the front porch swing. I’d really love a front porch swing. The exterior shot of the home reminds me of Jessica Fletcher’s home in Cabot Cove in Murder She Wrote. The original home is in Mendocino, California, on Little Lake Road. My brother lives on Little Lake Road. I spent many days watching Angela Lansbury filming in Mendo. Watching them turn Mendo into Cabot Cove was a real treat. The production changed the signs on the stores. Watching Angela walk down Main Street was a joy to see! Sorry to get off the main point. Cammie King, who played Bonnie Blue Butler in Gone With The Wind lived in Mendo. She recently passed. Maybe you could do a segment on Mendocino. Lots of beautiful homes and the local hotel is to die for. I didn’t notice it until your still shots, but it suddenly struck me that although the architectural features of the house are different, the decor and furniture placement, and even general layout of the house floorplan is a near Golden Girls replica. I wonder if they tried for that. Interesting! I hadn’t thought about that. It’s very “up” and fun – love the sofa tucked away in the corner. I think it’s really important to squeeze a sofa into the kitchen if you can! Fun post Julia! I don’t think that I noticed all of the changes over the different seasons. It is a cute show though. I have watched the show from the beginning and so I have waited for this post! I do love the kitchen floor and the way other spaces have evolved. The sitting area off the kitchen is one of my favorite spots with the red curtains. Also, I’d like to mention the little child’s chair that is hanging on the wall by the front door. I believe it holds a guest registry usually. 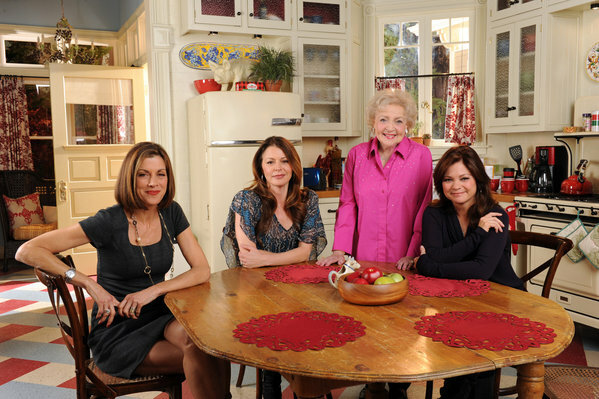 Episodes of the show first appear on the TV Land cable network. I’ve seen many of the episodes. The writing may not be the pinnacle of the art, but with that cast it’s always worth a look. The sets at least look like they might plausibly fit in the house shown for the exterior. Most sitcom sets are designed with really odd angled walls that wouldn’t fit into any house you ever saw (as Mark Bennett’s great book “TV Sets” illustrates). What a beautiful Victorian home! They did a great job with the interior. I love the colors, accents and furniture. They make the house seem so light, which I love in a home. Cute show and great set design, though some of the changes are confusing. Could you do a post on the sets on The Good Wife? I would love to learn more about them. 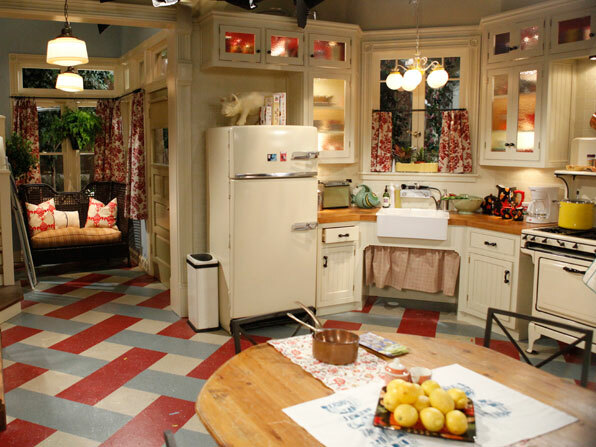 Does the kitchen remind anyone else of Family Matters? Maybe it’s just the staircase… now I need to look it up to make sure I’m not crazy. Great post! That show has gotten so much good buzz; I need to rent it from Netflix! Am I the only one, or did anyone else prefer some of the earlier room decors before they ‘glammed’ them up? 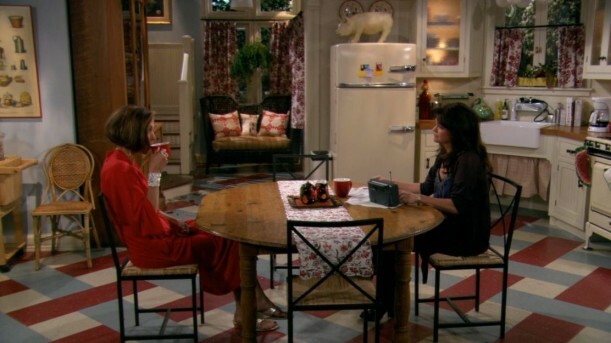 I actually liked the earlier version of the living room (after the leather chair was replaced); did anyone notice that they had three different coffee tables? Wow! That’s my house. I could move right in. And my favorite living room look is the slightly feminized later half of the 1st season, so nobody would even be using it anymore! Love, love, love the kitchen. Agree that I liked it slightly better before they updated it, but it’s thoroughly groovy by me either way. And that front door! I have that exact same front door on my 1899 cottage, an old summer cottage, in Mill Valley California. Whoops, I meant the back door. The kitchen door. Exactly the same. Now I realize it sounds like I meant that house is really like my house. Nope. That house is my dream house. My cottage is very sweet, but only 1,200 sf…and that’s divided between two flats! I love that kitchen…I keep trying to figure out how I can do something like that in the corner of my basement. I live just south of Cleveland. When I first moved here I wasn’t so sure I liked it here. I have to admit I really love now. Once you open yourself up and think OK it’s not the east coast so don’t even compare it you start to appreciate the area. We can live in VERY nice homes for a fraction of what it would cost in other areas. Also there’s something going on in the neighborhoods and is really breathing new life into the different communities. We had wonderful porch swings at two of our old homes. In the wee hours of the morning rocking my children out there was about as good as it gets. Nice memories. Haven’t seen the show…but maybe I will now! Love that kitchen…and the rest of the set is charming…especially the porch! Thanks for sharing! Love that big round table in the kitchen! So civilized Imagine them all lined up in a row on stools at a “breakfast bar” instead. 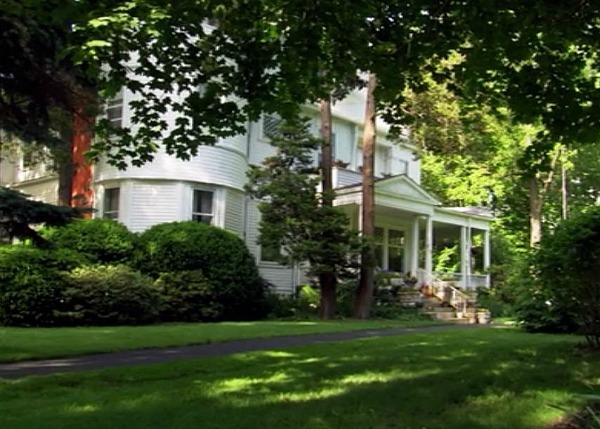 I love this show and this house. That porch is perfect! I love the whole house. I can’t remember the last time I heard the word “icebox” used. My Gram called it ( the fridge) that for years. She’s still around at 104 years old! What fun it must be to decorate sets like that . Thanks for a fun post. Back staircase!! I love seeing them in those Victorian Queen Annes. I know the back stairs were originally for the servant(s) to use, but I look for them. “Father of the Bride” kitchen set had one, later “Bewitched” TV episodes did also that I don’t recall them using and Family Stone movie had glimpse of one. More? I love the set. My tudor has the original 1930’s kitchen with no updates, in excellent condition, so it reminds me of this set. However, I don’t ‘love’ our floor. This kitchen floor would be perfect in my old tudor kitchen. The pillows on the sofa are from WORLD MARKET. Those little chairs are had from Hobby Lobby or Michael’s for around $20. Of course, you could find an antique salesmans sample if you want to spend a ton. I’ve never seen the show, but from these pics, it looks like the same/similar set as the one in the 90s sitcom “Sabrina the Teenage Witch”. On the same site, you can watch full episodes of the show…..
Has anyone else picked up on the fact that the window in the dining room behind the fireplace has trees in it, but there should be a hallway on the other side of that wall – the one that comes out by the back stairs in the kitchen and has the powder room off it? In the kitchen, next to the sink, is a green shark looking thing? Nevermind the paint! Where can I purchase the front door? I just got back home from Cleveland where we buried my father. My dad used to tell me stories about his great grandmother who, with her husband, built the Hot in Cleveland house. This couple, Brougham and Martha Harris, both lived in the house until their deaths. My dad used to go visit his great grandmother there where she would read to him and give him licorice candies which she hid in her closet. As a child, I remember our trips to the Westside where we still had family living and my dad would drive us by this house, called Lake Cliff, and tell us funny family stories. What a treat ,especially after being at the family gravesite where Martha and Brougham are also buried, to find out that their family home is now on TV! No kidding? Wow! I loved hearing your stories. Thanks, Lynne! Does anyone know any of the paint colors of the kitchen and living room? OMG! I live down the street from that house in Lakewood! I’ve never seen this show, but I’ve loved that house since I was little. It’s right by the lake, and it’s just as gorgeous in real life. So, is the refrigerator vintage or a reproduction? Does anyone know?